Mumbai, November 2, 2018: As travel and social platforms become even more intertwined, visual channels like Instagram provide users inspirational content for travel planning as well as a forum to document once-in-a-lifetime moments. At the helm of Indian luxury and hospitality, Taj provides a curated and eclectic set of experiences for the world’s most discerning travelers. For those who are visually and digitally inclined, the following five experiences are sure to instill both inspiration and admirable envy. Taj Lake Palace, Udaipur: During an insightful walk around the palace, allow a Taj historian to keep you enthralled with regal stories of the by-gone era, while learning little-known facts hidden throughout its heritage-rich corridors. Let it all soak in during a relaxing visit to the palace’s spectacular swimming pool overlooking Lake Pichola. 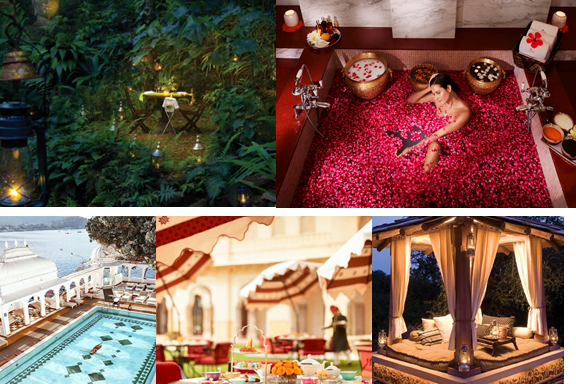 Taj Madikeri Resort & Spa, Coorg: Perched 4000 feet above sea level in the midst of a 180-acre rainforest, dine in an outdoor amphitheater illuminated with 101 glowing candles. Guests can choose their favorite global cuisine for a sumptuous 5-course spread served amidst a wondrous ambiance. Pashan Garh, Panna National Park: Enliven your evening in Madhya Pradesh’s Panna National Park with a cozy palanquin dinner for two, reminiscent of the bygone bullock caravans. Taj’s resident naturalist sets up a night camera to photograph creatures passing by your cottage, as you enjoy a luxurious night’s rest. Rambagh Palace, Jaipur: The ornate corridors of Rambagh Palace lead you through photo opportunity after photo opportunity—from afternoon tea and live performances at the palace Verandah, to private Baradari dinners followed by a dip in the ornamented indoor pool—Rambagh guests float through a surreal dream of Instagram worthy moments. Taj Nadesar Palace, Varanasi: Set amidst mango orchards and jasmine fields, enter the palace on a horse-drawn carriage and experience the life of Maharajas and Maharanis. Indulge in Jiva Spa’s signature Abhisheka ritual which includes cleansing of the body with the holy water from the Ganges and countless rose petals, inspiring awe-inducing photographs. Image Credits: The Daily Brunch does not hold the rights to the image.